21 August 2017 - Defence Minister as a force multiplier (By Lt Gen Bhopinder Singh (retd), former Lt Governor of Andaman & Nicobar Islands. INDEPENDENT India's short history has seen five of its Defence Ministers rise to be the Prime Ministers of India (Indira Gandhi, PV Narsimha Rao, Rajiv Gandhi, VP Singh and Chandrashekar), one Deputy Prime Minister (Jagjivan Ram), and two who went on to become the Presidents of India (R Venkataraman and Pranab Mukherjee). Besides these, topical satraps like VK Menon, Sharad Pawar, Mulayam Singh Yadav, AK Anthony and Arun Jaitely have adorned the office of the Raksha Mantri in the South Block of the Central Secretariat. Yet this crucial ministry in the national narrative is not the most-aspired for or sought-after portfolio amongst the mainstream politicos. As the corridor-joke goes, it comes without the "votes or the notes"! Ostensibly part of the critical Defence, External Affairs and Finance triad of national governance, currently it retains a lamentable status of “additional charge”. The post of the Minister of Defence (MoD) is the singular nodal point for all matters pertaining to the defence forces — all historic and prevailing woes, concerns and challenges that require “governmental approval” are supposed to be articulated, proposed and championed by the incumbent MoD. Therefore, notwithstanding the ceremonial position of the President as the Supreme Commander of the Armed Forces — the buck realistically stops at the desk of the MoD. The preparedness and the systemic angst within the institution is indirectly reflective of the quality of political support lent by the MoD to the armed forces, as the institutional caretaker under the constitutional wirings of participative democracy. Firstly, the material wherewithal. The lack of adequate weaponry, munitions, indigenisation efforts, wares etc..
Secondly, the personnel issues that include debilitating shortages of officer cadre, qualitative issues of intake, consistent down-slide in the official warrant of precedence, socio-economic degradation with issues like OROP and the successive Pay Commissions. Third is the crucial struggle with strategic integration. This includes concerns on insufficiency of joint-command structures within the three services, appointment of CDS etc. Lastly, the over-stretch of deployment, resulting in almost permanent deployments in insurgency-affected states, to now even in the realms of basic “policing” during civic disorders, in places like Muzzafarnagar and Rohtak. From time to time, specific issues of the defence forces hit their peak-decibels, with specific circumstances warranting their public concerns, mainstreaming and prominence. However, the specificities and emotional impulses of each of these institutional concerns bely the most fundamental issue concerning the defence forces in our form of governance — that is the historical absence of an empathetic, enlightened and powerful “voice” in the corridors of power, a “voice”, that in our constitutional-political-administrative construct, can only come from the Minister of Defence in India. Unlike, China or Pakistan, where the military apparatus and the accompanying “voice” of their defence forces are predominant and impactful, the tenets, instincts and compulsions of a democracy in India, relegates the bare necessities of the “voice” of the Indian defence forces to occasional faux-nationalistic fervour. This is without any meaningful investments in addressing the increasing laundry-list of institutional concerns. Reality is that from the inadequacy of fighter squadrons, basic infantry rifle procurement, OROP to even CSD-related concerns — the defence forces maintain a disciplined public silence. This is mandated in the constitutional wiring of “civil supremacy over military matters”. Whereas, the politicos and the generalist civil bureaucrats maintain an equally silent posture that basically exposes the defence forces to an unfair and undefended position of either misunderstood criticism, (for example the “Sahayak” system), disinterest (successive Pay Commission degradations) or even disagreements (annual budgetary allocations). This dysfunctional marginalisation of the armed forces on matters pertaining to security and the decision- making process has a historical faultline of suspicion of the “uniformed” fraternity by the politico-bureaucrat combine. This has been conveniently perpetuated by all political dispensations, irrespective of their ultra-nationalistic posturings. Of the 20 incumbents as the Minister of Defence, none except for the short tenure of Jaswant Singh, could claim any professional affinity or having propounded or published any seminal work on strategic/security relevance or on any other larger security imperatives. Also, unlike the Minister of Law (where 23 out of 26 incumbents have been lawyers), or in other ministries like ICDS, Tribal Affairs or Minority Affairs — where each and every minister till date has been from the respective domain, it is not essential that the Defence Minister needs to be an ex-soldier necessarily. The position demands an individual to feel passionately, intellectually and empathetically concerned about the institution. Former Minister of State for Defence, Arun Singh (Congress), like Jaswant Singh, (BJP) had a natural proclivity and sensibility on defence matters. Similarly, the Rajya Sabha MP Rajeev Chandrasekhar, though a civilian entrepreneur, has espoused the cause of the institution. None of the political heavy-weights can claim to such a concrete body of tangible contribution —materially, intellectually or even emotionally. From Baldev Singh (the first and the longest-serving MoD) to the military-despising VK Menon — the institution has steadily witnessed a free-fall in the decision-making hierarchy. Today the essential “sword-arm” of the nation has regressed to a purely “requisitioned-arm” that is utilised for its pure functional abilities, kinetic capabilities and delivering results (irrespective of the cost to itself!). 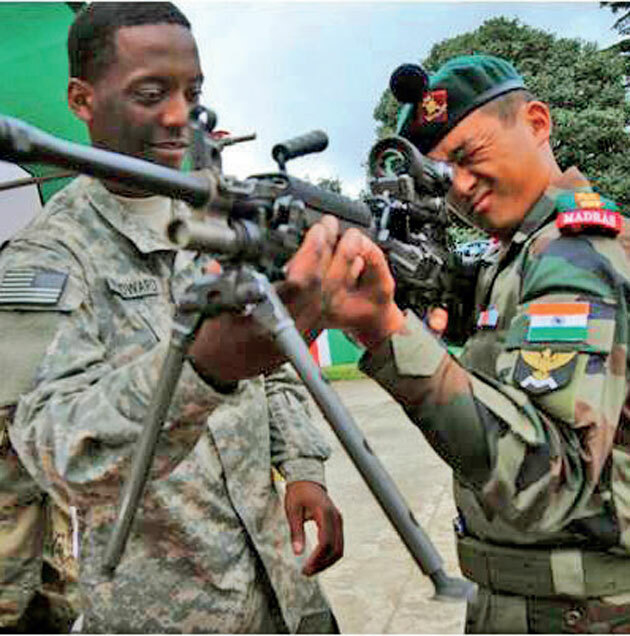 While India essentially lacks a strategic-security culture per se, the current civil-politico-military relations are fraught with increasing tensions and suspicions as the much-promised reforms and corrections have so far eluded the services. Today, as the nation undergoes its most ambitious and revolutionary fiscal reform via the GST, the same individual has the ominous charge of managing the parallel challenge of the ongoing stare-down at Doklam, in his capacity as the MoD. All global-powers without exception, combine the economic-military prowess in their quest to protect their sovereign interests and future needs. However India, with all its internal and external security challenges, has been consistently bereft of a passionate Defence Minister who could effectively subsume, address and allay institutional concerns. The fundamental issue has always been the Minister of Defence, whereas the headline-grabbing noise of specific individual issues is only an outcome of this historic anomaly. QUOTE. With a Defence Minster like Arun Jaitley n the Defence Secretary like this, 1962 is sure to be repeated. It was sheer apathy when DGIS was openly ridiculed yesterday by none other than Def Secy stating, "Gen saab ye wardi ki dhons dubara mat dikhana. You are just another organ of the govt. We know what we are doing. If army is not getting something it means some other organisation is being empowered to take on additional responsibilities". This remarkable remark came in light of DGIS raising concerns that even top brass of IA is answerable to the jawans and it is getting difficult for fd cdrs to ans unavailability of critical stores especially war like stores. Case in point was import of ATGMs. DGIS recommended import of only 50% of total defi and remaining can be developed by DRDO. He also told that DRDO has been incapable of producing effective ATGM since 2002 and even NAG has failed. But Def Secy was unmoved. He persisted by saying, "We know what to do. Moreover, no war is likely to happen, foreign Secy is already on it". UNQUOTE.